NORTHRIDGE, CA--Anyone who has ever witnessed or participated in an indoor swimming competition knows that acoustics play a significant part in the experience. Too reverberant and announcements become unintelligible; too sterile and the excitement and sense of place is diminished. JBL Professional Precision Directivity (PD) Series and Application Engineered (AE) Series loudspeakers are on the job at the 2008 Olympic Summer Games in the National Aquatic Centre in Beijing, to make certain that the sound will be exactly what it needs to be for the array of Olympic games taking place there August 8-24 this summer. The National Aquatic Centre, also known as the "Water Cube," features 52 PD5212/64 12-inch 2-way full-range loudspeakers, eight PD5122 dual 12-inch low-frequency loudspeakers, 12 AC2212/95, and 12 each 2380A 90- x 40-degree horns matched with 2446J 2-inch exit (4-inch voice coil) compression drivers. JBL's PD Series uses a full range, full bandwidth total system approach that allows contractors and consultants to design a fully integrated sound system that solves the audio challenges inherent to large installations. The AE Series loudspeakers provide a wide variety of building blocks for system design, stair-stepped to give the right solution for any installation. The "AC" models are compact loudspeakers that fit in areas where a smaller profile is required. 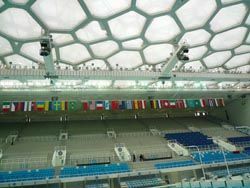 Designed by the China State Construction Engineering Corporation with a steel space frame clad with ETFE pillows, the National Aquatic Centre was purpose-built for the 2008 Summer Olympics and is one of the best-designed examples of an aquatic competition venue, with its acoustics specially tempered for the occasion. But with literally hundreds of microphones from scores of broadcasters globally relying on the sound system for both information and background sound, the performance of the venue's PA system is critical. The JBL loudspeakers are joined at the National Aquatic Centre by other industry-leading products from Harman including Crown CTs600, CTs1200, CTs2000, and CTs3000 amplifiers, Soundcraft consoles and BSS DSP utilizing HiQnet London Architect platform for control. "The National Aquatic Centre is among the most impressive architectural projects of the decade: it is a true monument to the Olympic spirit and the imagination of China," said Jon Sager, director of market development, installed sound, JBL Professional. "At JBL Professional, we're naturally honored that our audio systems enable the designers to marry form with function and that, with the help of our technologies, the stunning design in no way limits the spectacular sound!"